A decision to axe school buses for some special needs children is to be examined by a judicial review following a challenge by one affected family. Leicestershire County Council plans to stop providing transport for 16 to 18-year-olds and instead give families a payment to make their own arrangements. Stefan Drexler, whose daughter Kirstine makes a 26-mile round trip to school, said the change would be "harmful". The authority said it could not comment while the review took place. From September, all special educational needs (SEN) children aged between 16 and 18 will have council-funded taxis or minibuses replaced by a personal transport budget. Low-income families with SEN children will have to make an annual contribution of £330 - half the standard charge - but there will not be charges for eligible students aged between 19 and 25. About 420 families with SEN children will be affected, the county council said. In February, the county council said it needed to save £20m in special educational needs and disability costs, with an increase in council tax rates being used to create more local school places. 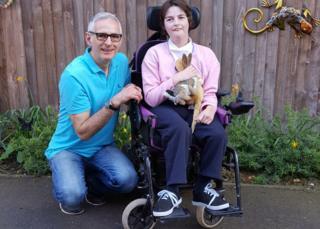 The family of Kirstine Drexler, 16, from Markfield, who has a 26-mile round trip to her special school, has brought the legal action. Her father, Stefan, said replacing the current service was "morally wrong", adding the personal transport budget did not cover the cost of transport and the council was "taking advantage of a loophole" by charging for services between 16 and 19. He said: "Losing the service would put a huge amount of strain on us as a family and we think it would also be harmful to her on a personal level and cause significant upheaval. "The council desperately needs to rethink these plans and consider the impact they could have on all of those affected." Steven Baylis, a lawyer at Irwin Mitchell, said the firm would argue the council's plans breached both human rights law and the Equality Act 2010. He said: "Access to transport is key to many people with disabilities receiving the education they require. "The family would rather not be in this position but feel they have been left with little choice but to bring this legal case because of the county council's reluctance to enter into meaningful talks about finding a solution." The two-day hearing at Birmingham Civil Justice Centre begins on Wednesday, and a judgement is expected within weeks.